The craving for wine and desire to sit by the TV and relax with a glass comes easily. Going out and buying the bottle is another thing entirely. Purchasing wine in general is difficult. Unless you’re a specialist, or have some experience and know what you like, the store can be a long maze of wine bottles. But which one do you pick? To make your decision easier, ask yourself the following questions. This will ensure you’re getting quality wine and not just a quality label. Even if your budget is quite low, there can still be one certain bottle of £6 wine that is better than the other. What type of wine is it? Table wines, for instance, are produced with grapes from a large region, making the wine bland and unbalanced. So have a quick read of that fancy label. The type of wine it is matters and each type has a name. 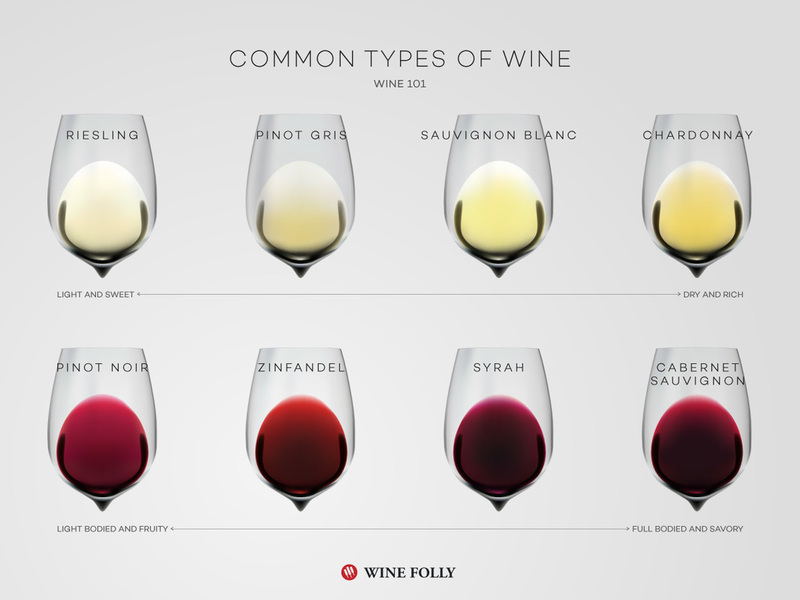 The image below explains how savoury or sweet each wine type is, considering if they're white or red. Have a look and decide which one fits you..
Mentioning a wine’s vintage (how old it is) seems like the main priority of a good wine. However, not all wines get better with age. In fact, most whites and sparkling wines don’t need aging. As for red wine, having a few years behind them can certainly improve its taste. However, each bottle is only sold after at least one or two years of production. Therefore, once it’s on the shelf, it is certainly drinkable. So don’t feel the need to buy a bottle today for next year’s party. Also, check out this blog about the health benefits of wine! Ask yourself these four questions to make sure you're getting quality wine and not just a quality label. The varietal of the wine refers to the type of grape it was made of. If the bottle says that it is varietal, then it means it has a multiple grape variety. This matters to some degree as it can tell you what to expect from the taste. There are 8 main types of wine. Red wine: Cabernet Sauvignon, Pinot Noir, Merlot, Zinfandel and Syrah. White wine: Chardonnay, Sauvignon Blanc and Riesling. There are many other varietal facts and details you can read about, concerning each of these wine types. That will certainly narrow down your options. Make sure that you asses the region the wine is made in and pick the right one. Having an awareness of best regions for wine is difficult and we can’t try every region just to see which is best. Instead, split the regions in two: old-world and new-world. For old-world wines, think France, Germany, Italy—those countries that have been producing and developing wine for centuries. Considering the time they spent improving their expertise over the years, they’re bound to have reached a pretty perfect taste. New-world wines however, are regions that may have only started winery more recently, such as Africa or South America. Nothing is to say their wine isn’t of great taste. In fact, they are known to be sweeter-tasting because of less ageing. However, old-world wines may be more fit for wine-lovers that are just beginning to expand. Below are links to more guidance in making that perfect wine bottle purchase.